Tony Wong 's Lean Manufacturing Concept 's Blog: Lost of Toyota! Here is an article from Wall Street Journal, A Scion Drives Toyota Back To Basics . I was so surprised by the article and I think the world was set on fire by the story. Therefore, I want to share with the people who is interesting for lean concept. "Three top executives, including Mitsuo Kinoshita, announced their retirement. Akio Toyoda is the first member of Toyota's founding family to take the helm in 14 years. Toyoda's appointment as president is pending shareholder approval in June. ...... Toyota bulked up in recent years and is now stuck with too much manufacturing capacity. It might also be faced with its first layoffs in Japan since 1950, when 3,000 workers were let go." For a long time, we are learning lean manufacturing (or TPS) and we lelieved that the concept helps many kinds of industry to get higher profit through the way to eliminate the wastes. Why the most famous company in lean world, which is the originator of lean manufacturing, sufferred the bad situation? In this financial tsunami, is that the lost of Toyota reflects the invalidation of lean manufacturing? The answer is "NO", the lean concept has never invalid, the problem is Toyota got lost in front of the number game. Please read the below. "An unprecedented number of unsold cars in Japan has forced Toyota to stockpile them in the parking lots of Fuji Speedway, a company-owned track near Mount Fuji. ....... I think Toyota probably over-expanded a little bit in order to compete with the American auto makers,' said his father, Shoichiro Toyoda, 83, who himself was the auto maker's president during the 1980s. " The first waste of 7, over-production. It looks to me that Toyota forgot the 7 wastes principle. On the other hand, what is the meaning of over-expand? What is the meaning of over-capacity? In result of over-expand, it forms the over-capacity. In the same way, in result of over-capacity, it forms the over-production. Over-production forms the negative effect in P/L. The leader is only focusing on how they achieve the short term target, they only remember the number they needed to made this year. Basically, they only achieved their personal target to make somebody happy in board of director, but they forget the long term goal and the most inportant thing of company, the mission. "There's a move away from technologically sophisticated in-car gizmos like a solar-powered cooling system designed for the new Prius and expensive new assembly-line technique of dipping car bodies into a vat of paint and swirling them around. ...... The company is also reining in its engineers, who have been designing new features that occasionally appear to be out of character with the company's utilitarian roots. For example, the new Prius, launching this year, has an option for a solar-powered ventilation system designed to keep the interior cool when parked. Gizmos like these helped lift the car's retail price to an estimated $28,000, according to analysts, compared with the $22,000 currently." Yes, it sounds good if the interior of the car is cool when I back the car in carpark of summer days. But, how many months I need that function? I believed I need that only 3 to 4 months in a year. Do you willing to pay US$6000 more to get that thing? For me, no way! 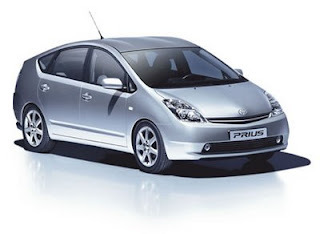 May be I need that if I can afford to buy a Benz or BMW, but I do not expect that happen in a PRIUS. I don't know what is your comment, but I think it is also over-production, or we can say "over-design". The management of product developement is also forget they only need to design something for customer demand, I meant free of charge. "Then there's the shabu shabu paint system. Toyota's manufacturing division is one of the company's proudest operations, having developed a highly efficient 'lean manufacturing' philosophy. To replace the traditional system of slowly dragging a car through a 115-foot-long bath of anticorrosion undercoating, Toyota engineers came up with a new process in which a car body gets picked up by a robot arm, then swished around in a pool of paint, cutting the length of the line. However, the new system costs roughly four times as much to set up as the traditional process, while producing what Mr. Toyoda felt were minimal improvements in the quality of the paint job and its efficiency." I think it would reduce much space for the painting if they paint the car as a hot pot way. In the point of no change in quality and efficiency but four time of cost higher, are customer want to pay for that as their willings? For myself, I need a car has a good coating to prevent the rust, but I don't care how to paint it from the manufacturer. I can not see how they paint the car, offcause I can not feel the exciting of painting a car in hot pot way, at least when I am driving. Why I need to pay for that? Yes, this time, the company remember the lean concept, the waste of motion, but they forget the top principle of lean. What is value-added process? I am sorry that I am not going to attack Toyota. Actually, I like to drive a Toyota car. I felt safe and comfortable when I was driving that, just hope Toyota can find the way back and continuous to build the car as our need, not as Toyota needs. [color=#5588aa]Артисты на праздник [url=http://dejavu-group.ru/index.php]Deja Vu[/url] - это коллектив заслуженных вокалистов и музыкантов на праздник. [url=http://dejavu-group.ru/svadba.php]Дежа вю[/url]- лидер в области проведения и организации музыкальных мероприятий, свадеб, юбилеев. Музыканты на праздник Dejavu-group обладает мощной качественной аппаратурой, позволяющей наполнить плотным и приятным уху звуком как компактное помещение (фуршет), так и огромное помещение (корпоратив до 1000 человек). It gets down to choose a proper companion who utilizes your money in a right way - that is incorporate it in real deals, parts and divides the income with me. Lean in American way? in Japanese way?